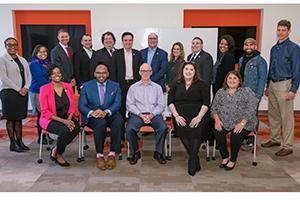 This year brings six impressive new members to American University’s Alumni Board. Their diverse perspectives and insights will strengthen our already-dynamic alumni leadership. With a history dating back to the 1950s, the Alumni Board leads AU’s alumni association, providing perspective and insight to professional staff in their outreach to alumni. Alumni Board members advise the university regarding how to improve the student experience. On the board, all five schools and colleges are represented, as well as varied professional industries, backgrounds, and generations. Elliot has been an energetic supporter and advocate of AU since his graduation. He has served as a member and president of the DC Young Alumni Chapter. Additionally, he served as social media and marketing co-chair of the All-American Weekend planning committee from 2014 to 2015. He has interviewed prospective students and regularly attends AU events. Melanie also has been actively involved with AU. She has spoken on the Multicultural Student-Alumni Career Panel, led discussions with current students, and participated in School of Education advisory council meetings. In addition, she has attended numerous AU events. Peter has remained involved with the AU community in various ways since graduation. He served as a graduate student mentor for the SPA Leadership Program, provided tours of Bloomberg to current AU students, conducted informational interviews for students and young alumni, and prepared meals for students at the Kay Spiritual Life Center. Additionally, he regularly meets with the Office of Community Relations regarding various initiatives such as the Pep Band and planting trees on campus. “Keesha” is actively involved with AU. She is co-chair for the Future Alumni/Student Outreach committee of the Black Alumni Alliance. She also previously served as chair of AU’s Staff Council. In addition, she has attended numerous AU events and regularly interacts with current students. Derrick remains connected to AU by recruiting students for Freddie Mac’s Finance and Accounting Rotational Analyst program. Additionally, he has served as a guest speaker in a number of Kogod’s Finance and Accounting courses. John remains connected to AU by mentoring current students at the Washington College of Law. Returning to the board with renewed two-year terms is George “Cookie” Reed-Dellinger, Kogod/BS ’69, Kogod/MBA ’71.